This week over at Everybody Art Challenge the theme is Spring. Given the wet weather that we are suffering in Oxfordshire I immediately thought of April showers (ignoring the fact we are still in March). I have made my card using the Basic Grey - Pheobe and Blush paper range. The cute image is from Hanglar & Stanglar and I have cut her out and attached with foam pads. The ribbon was one of the very few things I purchased at the NEC at the weekend. Not that I couldn't have found things given the chance. I had two Nieces in tow as a birthday treat and I spent the day answering their questions, watching demos and purchasing things they wanted. It was their first visit and they enjoyed it so a good day for all! I had planned to go back on Sunday but figured I could just purchase items off the web with the money I would save on parking and admission. I haven't purchased anything yet! Jenny this is so very beautiful! She is so adorable and I love those gorgeous colours! You must be the best aunt ever! Oh WOW Jenny gorgeous card. I love these cheery colors and this cute image! 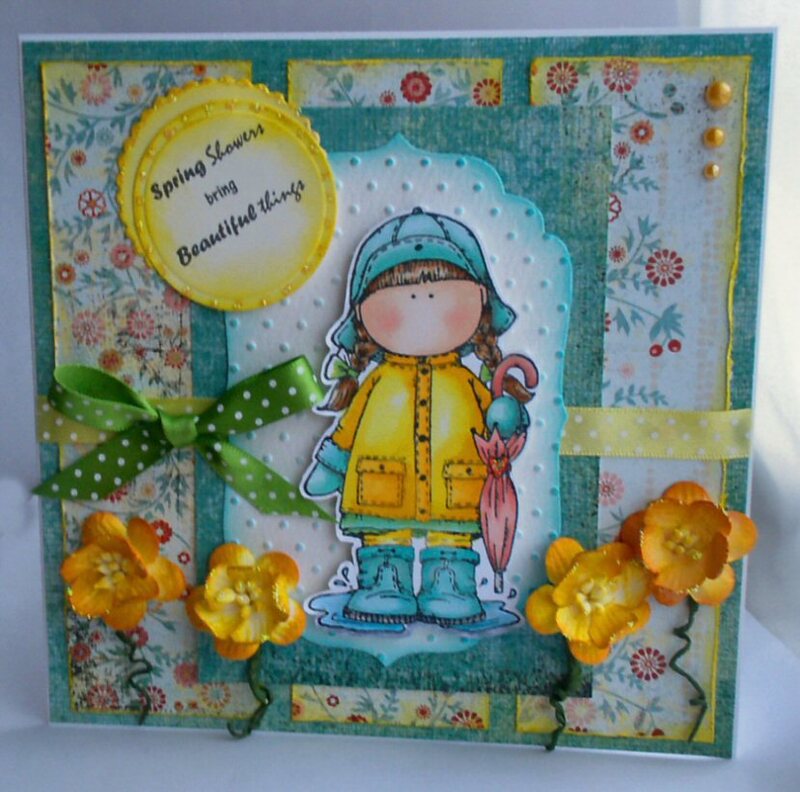 Lovely Spring card! p.s. Jenny did you know your Alice in Wonderland creation made Top 5 at Fussy and Fancy? There's a blinkie waiting for you...! What a beautiful card,love the colors and what a great image.